As any cook or baker knows, baking is a science. When baking cakes, cookies, pies or muffins exactly measuring your dry ingredients is paramount to success. Unlike other forms of cooking, you simply cannot throw in a bit of this or a bit of that. 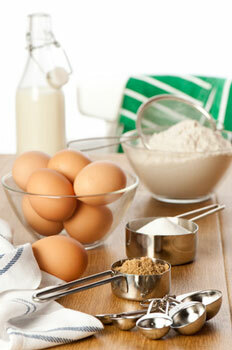 Most recipes follow a specific formula using basic ingredients such as flour, sugar, butter, eggs etc. If you alter that ratio your results will not be the same. Which means that your ingredients must be measured out. This can be done either by weight or using calibrated cups or spoons. Many recipes give ingredients in both cup measures and weight. Follow one set of measures only – they are not interchangeable. Why? Because when converting ounces or grams to cups, only approximates are given. To get the same results every time, it is important to use standard measuring equipment, not regular kitchen cups and spoons. Measuring by weight is the most accurate way of measuring dry ingredients. Spoon the ingredients into the bowl or tray on the scales. 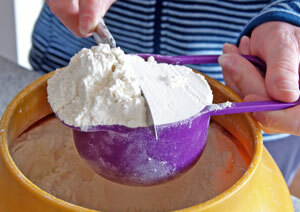 To measure with a spoon, scoop the flour with the spoon then level off with a knife. 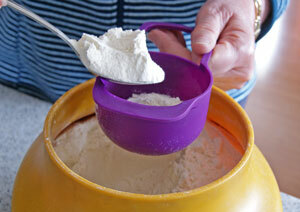 Dry ingredients such as flour and sugar are measured using specially calibrated measuring cups. It is recommended that you use these for baking. You will get a far more accurate measurement which could otherwise affect your baking. 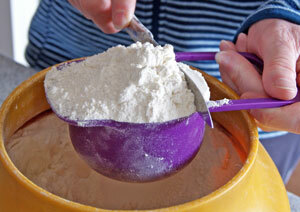 Before spooning the flour into the measuring cup, stir it lightly with a fork to aerate it. Fill the cup by spooning the flour into the cup. But don’t pack it down. Just tap the cup lightly. Level off the excess flour by sweeping the straight edge of the knife across the top. 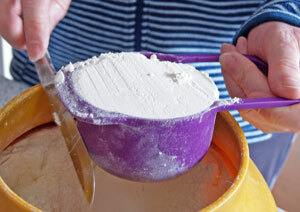 Fill with the flour, level with the back of a knife, then scoop out about 1 tablespoon. What is a generous cup? Fill the cup, level with a knife, then add about 1 tablespoon. Spoon into the cup and level off the top with a knife the same as for flour. Should be sifted before measuring. Spoon into the cup then level off with a knife. When a recipe calls for packed brown sugar, it means the sugar should be firmly pressed down into the measuring cup. Spoon the sugar into a dry measuring cup then press the sugar into the cup with the back of a spoon. Continue to add and pack more sugar until it reaches the rim of the measuring cup. Then level off with the flat side of a knife as you do for flour. If the recipe doesn't specify that the sugar be firmly packed, simply lightly spoon the brown sugar into the cup then level off with a knife as normal.